WASHINGTON—With the federal government intent on shredding safeguards for some streams and wetlands, environmentalists were parched for proof that not all waterways need be in jeopardy. That thirst was quenched recently when a federal appeals court dismissed a major housing developer’s bid to challenge a master plan designed to protect a sensitive waterway that serves as a crucial drinking water source in the Washington, D.C. region. 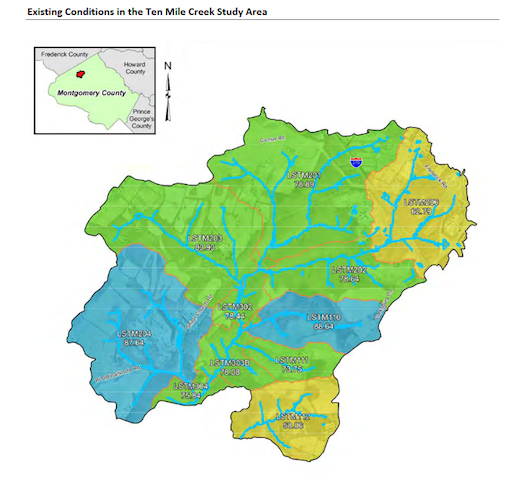 The appeals court’s Nov. 29 dismissal essentially squashes plans by Pulte Homes to build close to 1,000 houses near fragile sections of the Ten Mile Creek watershed in Clarksburg, Md. Clarksburg is in Montgomery County. A Maryland non-profit organization cheered that decision—and a similar one reached by a federal court earlier—because both confirmed that Montgomery County’s science-based decision-making and strict land use plan are on solid legal ground. Conservation Montgomery is a coalition of organizations that address a broad spectrum of environmental and quality of life issues. Caren Madsen, who chairs the nonprofit’s board of directors, tells Renewal News that local elected officials and agency managers are best equipped to determine the outcome of environmental issues. Montgomery County, which shares a border with the District of Columbia, established a master plan in the early 1960s. That document served as the foundation for several other measures, including an amendment in 2014 that capped impervious surfaces along the most sensitive areas of the 4.8-square mile Ten Mile Creek watershed. Framers cited open space and low density-mandates as crucial to preserving streams and drinking water supplies. Pulte Homes, part of Pulte Group and the nation’s third largest builder, took the county to court in an attempt to weaken that restriction. Pulte had planned to build at least 954 detached homes and townhomes on 540 Clarksburg acres it purchased between November 2004 and January 2006, according to court documents. LSTM 110 and 111 are the areas along the upper part of Ten Mile Creek where Pulte bought land. Ten Mile, the county’s highest quality creek, and its tributaries measure 22 miles. They are a key water source for Little Seneca Reservoir, the metropolitan area’s back-up drinking water supply in the case of drought or other emergency affecting the mid-Potomac River. In its initial lawsuit, Pulte sued the county and the Maryland National Capital Park and Planning Commission. The company claimed the county’s master plan was depriving it of its constitutionally protected property rights. 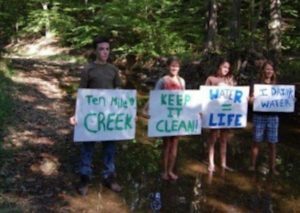 By 2016, Pulte’s litigation expanded to include Conservation Montgomery and the dozen or so advocacy groups and individuals who had formed the Save Ten Mile Creek Coalition a few years prior. In an odd twist, Pulte’s attorneys also sought private communications and other information from Conservation Montgomery and groups such as Audubon Naturalist Society, Clean Water Action, Friends of Ten Mile Creek and Little Seneca Reservoir, Montgomery Countryside Alliance and the Sierra Club. Attorney Donald Mitchell, with a Washington law firm, represented the citizen groups and individuals who backed the Ten Mile Creek land use plan. His intervention narrowed the scope of Pulte’s subpoenas to include only public communications with the county. The U.S. Court of Appeals for the Fourth Circuit, which heard the case on Sept. 25, ruled that the federal District of Maryland Court was correct in dismissing the case because Pulte had no constitutionally protected land rights. Mitchell said Pulte could either develop in accord with the county’s restrictions or sell the property. Officials need to be able to make the important decisions they were elected to make, he continued. Previous PostRestoring Beaches: As hurricanes surge, is there enough sand to go around? Next PostBeyond Lip Service: Why can’t Congress fund an Rx for Appalachian coal country?